Today we were up at sunrise and viewed a fantastic dawning of a new day from our campsite perched high above the Atlantic Ocean. Making a cup of coffee while chatting with our neighbors and breaking camp we were excited to be on our way as we were now headed toward the north coast of France. As we skirted by the north side of San Sebastian it gave us time to reflect on our trip and the wonderful people we had met along the way. Everybody with a kind word, a wave and at times, a beverage as we took the time to talk with people of so many cultures and ethnic backgrounds. As I write this Paris has just come under attack from a terrorist group. My positive thoughts go out to the people of France, Europe and the entire world, for peace, understanding and tolerance. In this time of government scare tactics and the press reporting for headline grabbing stories and jockeying for ratings and sales, I would urge all people to strive for the truth and not just follow slanted reporting. The people of the world are still the same. We just have to be as vigilant out of this country as in LA. Be aware of your surroundings and talk to people everywhere, and continue to travel. Done, and on with the trip. Crossing into France we kept to the small roads staying near the ocean finding interesting , small villages as we rode north toward the Bordeaux region of France and the vineyards of the Rothschild estates near Pauillac. The areas and towns west of Bordeaux were touristy so the quaint little villages we were hoping to find were all built up. Arriving at the vineyard to have a look around was disappointing as we were told we needed reservations, in advance, and other than that, we had to leave. That’s one way to get rid of a couple of motorcycle riding Americans. Oh well. Onwards and north to a fun, smooth ferry crossing at Le Ver-sur-Mer to Royan. As we rode north, turning randomly at forks and intersections, following whatever road looked the most interesting, we passed an ancient looking, deserted church. Our interest peaked as we turned around and slowly approached this beautiful structure, stone spires and a bell tower thrusting skyward. We stopped the bike across the street in a lot with one other vehicle parked in a small, dirt parking lot. Getting off the bike we spotted a man 5-6 meters from us, sitting in a clearing in front of his car. He was dressed in long robes with long, brown shaggy hair and a long beard. You guessed it. Melanie and I looked at each other and whispered into our helmet mikes, ‘Jesus??’. He was just sitting and looking at the church, de L’egice Saint Pierre. A small sign told of the church and the Celtic inspired design. Walking through the tombstones of the ancient cemetery gave us a strange feeling. The stones in the yard directly in front of the church were weathered and had a crusty, stone to greenish growth covering the grave markers. The front of the unkept church, which was open, displayed an upside-down cross, carved stone statues of saints and a large red, arched entryway in which two doors were built into. Pushing through one of the doors led us into a simple interior, just stone walls and a simple barren altar with signs of the templars carved into the supporting columns. Returning to the bike, ‘Jesus’ is still sitting peacefully, quietly watching the church, all alone. As we ride toward town our thoughts and comments turn toward the Christian bible stories and how a simple carpenter was taken to be their savior and how in these days, the same simple man with similar ideas would be tossed into the nearest jail. Interesting. I have tried to follow our route to determine where this town was, without success. There were several other structure with interesting histories, including a circular pigeon coupe with holes in the interior that would house over 1000 birds. As it was getting late in the day we started to look for a campsite, finding the Camping du Bois de St Hilaire, in Chalandray. Pulling through the welcoming gate of the campground to the voice of a wonderful woman proprietor, speaking proper English, was a nice surprise. Monica told us that we were the first Americans that has ever stayed in her campground, much less on a motorbike. We talked about how they had become the owners of this wonderful place. Being seasoned caravanners around France for 30 years they decided they just wanted to be right where they were now. Great people. After setting up our camp in a wonderful wooded area we set off for town finding a fantastic little bakery on a corner with a couple of tables for 2 in the front. The smell of fresh-baked bread and pizza wafted out of the open front door, inviting a passerby passed the entrance and to the glass enclosed display case and the welcoming smile and ‘Bonjour’. The pizza had been recommended to us by Monica and our slices of meat pizza on fresh-baked crust were completely amazing. The next morning we rode north to the Loire River and Valley wanting to check out and possibly tour a couple of chateaus. The one we wanted to see was Château d’Ussé, or the castle of Sleeping Beauty. 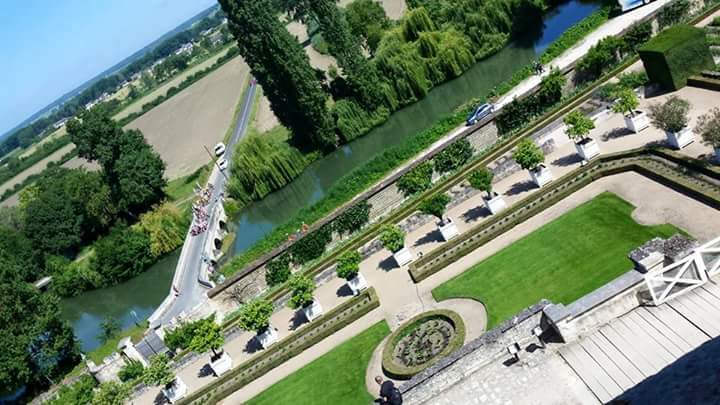 The grounds consisted of a chateau, a beautiful gardens with views of the valley and a private family chapel. All the structures were well maintained with period furniture and tapestries on the walls in the chateau, with guards watching your every step. I really dislike the tourist areas and much prefer finding things off the beaten path in small towns with their wonderful, interesting people. Even with a language barrier, stories can be told. We continued on our way along the river seeing several beautiful chateaus but most were busy with tour buses and we continued on, just looking. Tomorrow, the north coast of France, and the WW2 memorials we are so interested in exploring.